Last night, I, along my fellow esteemed members of the world of NY based heavy metal press, went to a special listening party. It was for the latest release from viking/ melodic death metal masters, Amon Amarth- Jomsviking. Held at heavy metal bar St. Vitus in Brooklyn, where signer Johan Hegg as present at the event. Later that night he was going to DJ for the fans. He was there with his wife and was very friendly, talkative, and personable. Horns up! Here I am with Hegg, himself. Like I said above, he is a very cool and awesome dude in person. This lyric booklet was given to the press on hand. 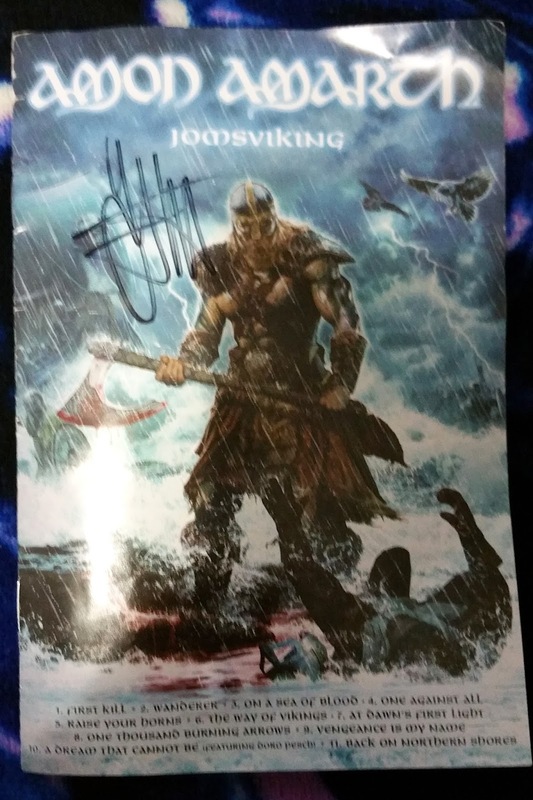 Hegg signed it for me! 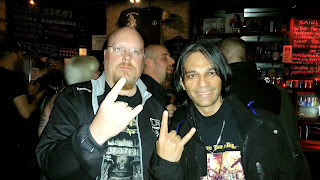 Metal Blade founder and all round legend Brian Slagel!!! I was honored to meet him. That's Don Jamieson of That Metal Show in the awesome Amon Amarth hockey jersey. I do hope they find a new channel, cause that show needs to come back on and now! I gotta say that I really liked the new album. Jomsviking is clearly another solid entry in Amon Amarth's tremendous discography. I also should mention that the tenth track "A Dream that Cannot be" has guest vocals from metal legend Doro Pesch! I can't wait to get it myself and give it a good listen. The album is officially released on March 25, of this year.